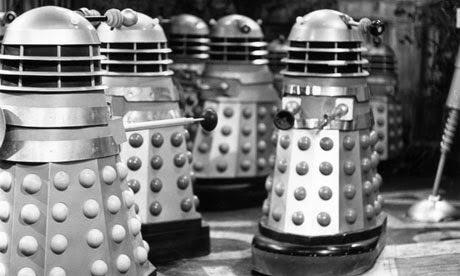 DOCTOR WHO Dalek Week - Looking back at THE DALEKS | Warped Factor - Words in the Key of Geek. Tom Pheby looks back at the debut adventure for the Doctor's greatest enemies, The Daleks. 1963 was a seminal year in Doctor Who and television history, 'The Daleks' affirmed William Hartnell as The Doctor, gave us the most celebrated iconic villain of the series and increased the viewing figures from 6.8 million to 10. It gave Terry Nation his finest creation, contributed heavily into making the show a phenomenon and totally captured the public imagination. It was like the lit fuse of a giant explosive, too late to run back and attempt to extinguish it with two fingers. To review this show appropriately you have to remember that it was groundbreaking telly, an ongoing experiment that involved trial and error which offered something that the viewers had never experienced before. Yes budgets were restricted, and there were clear limits to what the show could physically deliver, but that aside there are some beautiful plus points to be had. Hartnell performs wonderfully as the wizened and curmudgeonly Time Lord and revels in the role, although he is strangely absent from the proceedings on occasion leaving his humble companions, Susan, Ian and Barbara, to prop up the scenes and carry the load. Ian, played by William Russell is cast as the physical have-a-go-hero, whilst (with the greatest respect) Carole Ann Ford and Jacqueline Hill provide the fluff. The Daleks thunder on the Screen with bristling menace and cement their place in the psyche of the 'Nation' (pun). But before I outline the Story, it's worth looking back at the ripples behind the scenes that nearly prevented it from happening at all. Sydney Newman head of BBC drama was totally against this latest addition because it broke the Beebs golden rules for the programme. Doctor Who had to avoid "bug-eyed monsters" or "tin robots" at all costs - oops, big tick for both. 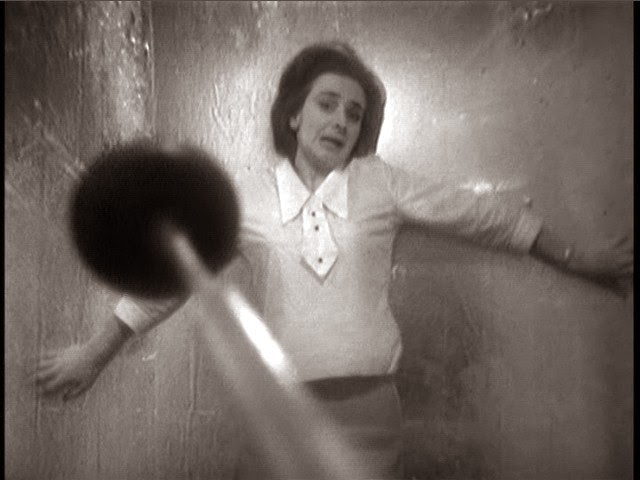 The shows spirited producer, Verity Lambert, had already commissioned the script, but had a number of the others been submitted on time, its a distinct possibility that The Daleks would've been unceremoniously dumped. As luck would have it, The Daleks was the only script available and so the story went into production earlier than planned, plus it was increased in it's length - that's just typical of critical moments in the evolution of Doctor Who. Anyway on to the story itself, as you may already know it features two species that survive the devastation of nuclear war. One species, the Kaleds /Daleks, have mutated and thrive in the polluted environment. The other, the Thals, are threatened with extinction from the high radiation levels. The TARDIS settles between the remains of a petrified jungle and a far off city, where should they go? This intriguing situation presents a conundrum for the main characters, especially for Hartnell's Doctor. Should they explore the surroundings and get involved in the unrest or leave as fast as the TARDIS can carry them? So the mischievous Time Lord pretends that his machine is unable to leave due to a faulty fluid link, to satisfy his ego and curiosity with near fatal consequences. The Doctor misleads his fellow travellers further by insisting that he may be able to obtain the necessary Mercury from the inhabitants of the City and fix the link. It's the first time we see this devious side of the time traveler and it is very typical of this incarnation, and it's also bitterly disappointing to learn this about our hero. In due course we are introduced to both sides of the argument, their respective predicaments and fight for survival, but in the meantime its a long walk. When the Doctor finally meets the Daleks they are plotting to destroy the Thals by increasing the radiation levels, and so we learn for the very first time that they are not capable of compassion or remorse. We don't really get to know who were the victims of the situation, only Terry Nation really knows that and sadly we cant pick his brain on this one. Not that it matters or spoils the story in any way. We do know for certain that only one out of the two species can now live on, the Daleks are impervious to the radiation levels and the desperate Thals rely on the limitations of an anti radiation drug. It's a sign of Nation's creative writing that builds up to his finest Story "The Genesis of The Daleks", and despite the basic sets, the shadows cast by studio equipment and the odd verbal pause (provided mainly by Hartnell who already seems to be scrambling to deliver his lines) it's perfect in its imperfection. The story here is strong, convincing and atmospheric, throwing up questions that could be leveled at our own society and how it behaves towards others today. The sad part about it are the feint signs that even in this very early stage of the series Hartnell is struggling to cope with the enormity of the role and schedule, this could explain my aforementioned moan about him not being evident for parts of the story. After The Daleks was broadcast Doctor Who was firmly established in the television schedule and in the hearts of children across the country. 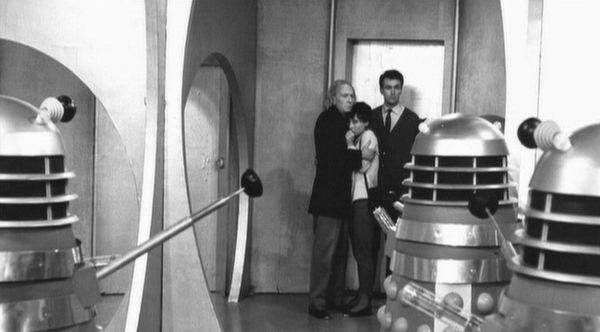 1964 saw Dalekmania arrive further cementing Doctor Who's place in British television history. I often wonder if we would have been celebrating 50 years of the show if this story had not been produced? It's certainly something to think about.